I had picked up this book on a trip up to Powells, most likely for my birthday. I just hadn't gotten around to reading it. I had no idea what it was about. I selected it because I had enjoyed Tuck Everlasting so very much. (Linked to my review.) Not being familiar with anything else that Babbitt had written, I thought I'd give this one ago. Simply put: I was delighted from the first page! I just had a feeling this book was going to be good and I was going to love it! As the story opens we are introduced to DeCree, the prime minister, who is putting together a new dictionary for the kingdom. The story then introduces a villan, Hemlock, who does indeed want to destroy the kingdom by starting a civil war so that he can claim the throne for himself. We dive deeper into a story of a long forgotten mermaid who has lost her rock doll and a mysterious whistle/key which will help her to find it again. We meet dwarves and angry farmers and minstrels from far away lands. Gaylen is working hard to try to take the King ordered poll, but he meets with trickery and chaos which is created by Hemlock. Being a nice and pleasing fairy tale, all ends well and everyone agrees upon the definition of delicious. If there is a special message inside of this book, I could not discern what it was. To me it was an entertaining story and a nice diversion. Apparently this book was listed as the 1969 New York Times Book Review Notable Children's Book of the Year. I thought the book humorous and spell-binding. I was completely captivated by this rather quick read. The chapters themselves are very short making this an easy book to read aloud to a younger audience. I happened to read this one on my own time and found it incredibly enjoyable. I give it two hearty thumbs up on being an engaging and fun read. Sounds like a really fun story! I've learned lately that my library has a problem losing older books. :P After your review of Tuck Everlasting, I saw online that my library had this book. When I went to check it out, it wasn't there. Apparently, another lost book. I do really want to read this one, though. Hooray for no hidden agenda! haha! I liked this book too, and even though I knew who wrote Tuck Everlasting I didn't realize it was the same person who wrote them both. Odd revelation. I don't like Amazon's cover art EITHER! Ours is slightly similar to yours, but perhaps even a little more juvenile looking. Very good story though. I didn't LOVE Tuck Everlasting, maybe because I was too old when I read it and thought it sort of odd. I'm willing to give NB another chance, though--you make this one sound wonderful! I think we'd like this one. Thanks for the review! Sounds like fun. Since my library has a copy, I'll be adding it to my TBR list--although I'm sure I'll be searching my hardest for a hidden meaning now that you've challenged me thus! Thanks for this review. I picked up Tuck Everlasting at Goodwill (35 cents - score! 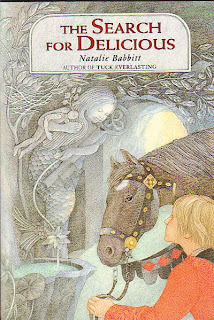 ), and they often have other titles by Natalie Babbit. I'll keep an eye out for this one too, now, and I agree with you completely about the old vs. new cover!